Posted on February 4, 2016 by bibbyoncooperatives Tagged All Our Own WorkHebden BridgeJoseph Greenwoodproductive cooperation	CommentsNo Comments on Co-operative history lives yet! 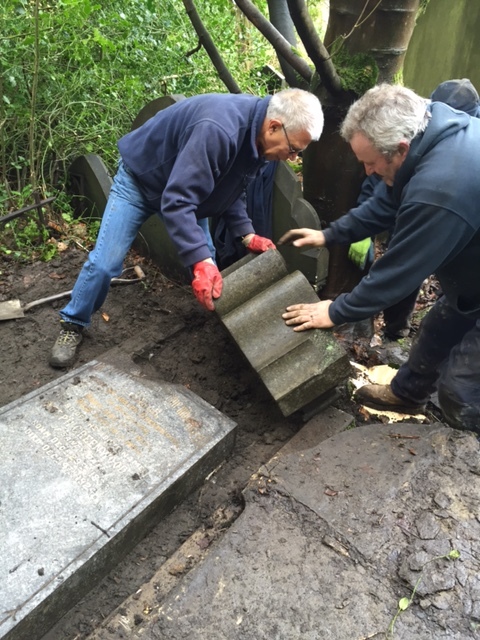 Having written All Our Own Work last year, the book on early productive cooperatives where the cooperative pioneer Joseph Greenwood was the central figure, I’ve been delighted to get an email through which tells me that his grave in Hebden Bridge’s Sandy Gate cemetery has been restored. The gravestone had toppled over on to its front, leaving the grave unidentified. That’s now been remedied. My photo shows members of CROWS (Countryside Rights of Way Service), itself a cooperative, hard at work. Joseph Greenwood is buried a very short distance from another important early co-operator, Jesse C. Gray. Gray, originally employed at the Hebden Bridge fustian cooperative, went on to become the Co-operative Union’s General Secretary at a key time in the movement’s development. His grave is marked by a marble monument funded by the movement. Greenwood’s and Gray’s graves are included on an e-trail of radical and cooperative Hebden Bridge, available for downloading as a mobile phone app from http://www.pennineheritage.org.uk/Pennine-Trails. The trail is also available in booklet form from the local Tourist Information Centre. This entry was posted in Co-operatives and tagged All Our Own Work, Hebden Bridge, Joseph Greenwood, productive cooperation. Bookmark the permalink.